Norman Osborn played a decisive role in thwarting the Skrull attack on Earth and for that effort he's become the poster child for humankind's resistance and strength. 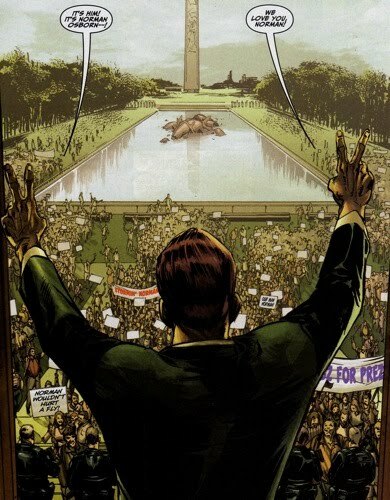 Soon after the dust settled from the Skrull defeat, the President requests Norman's presence in Washington. But the action does not cease at Thunderbolts Mountain, in fact, Norman begins cleaning house and lets old vendettas settle themselves. 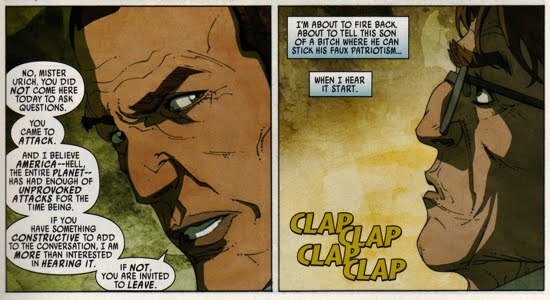 In Thunderbolts #126, while Norman is off in Washington D.C. receiving praise for his actions during the invasion, the rest of the Thunderbolts team remains back at their mountain base. Swordsman tells Songbird that Norman Osborn will die at his sword and that Norman is going to be cleaning house and that she should watch out. While at a hearing with the Senate Oversight Committee, Norman denounces S.H.I.E.L.D./S.W.O.R.D./C.S.A.’s prior actions, holding them accountable for the invasion. Osborn suggests that an independent body should be formed to determine liability and weed out those responsible. He then resigns from his post as the director of the Thunderbolts and formally disbands the team. Meanwhile, Moonstone begins breaking the team apart back in Colorado, by drugging Penance and getting him committed to a maximum security mental asylum. Radioactive Man's visa is revoked and he is immediately recalled to China. Bullseye then attacks Songbird in an attempt to settle a score that dates back to one of the teams earliest conflicts with the American Eagle during the Faith in Monsters arc. Osborn's decimation of his Thunderbolts team proceeds further in Thunderbolts #127. Continuing from the cliffhanger at the end of the prior issue, Songbird is able to narrowly escape Bullseye, who then loses track of her. Soon after, Songbird attacks Moonstone and Bullseye using the Zeus aircraft to launch missiles at them while they are caught off guard. Venom then attacks Songbird in the aircraft, which crash lands outside their base. Moonstone informs Bullseye that the nanochain restrictive technology had been compromised by Captain Marvel when he had invaded their facilities. This infuriates Bullseye who only remained at the mountain because of that threat. Moonstone then encourages Bullseye to remain by enticing him with Norman's new offer for Bullseye, it is not revealed what that offer is. Later, Swordsman neutralizes Venom and Bullseye who had tracked down Songbird, he then destroys the Zeus. Swordsman encourages Songbird to flee and that he will tell everyone that she was vaporized when the aircraft crashed. It is now apparent that Norman had ordered these attacks on the group members Songbird, Penance, and Radioactive Man in his effort to clean house. A new Thunderbolts team is on the horizon and the Dark Reign officially begins. Although it appeared like Norman had the whole world eating out of his hand, there was one person who did not trust this heroic Osborn. As Osborn rode a wave of public sentiment of distrust toward Tony Stark and S.H.I.E.L.D. 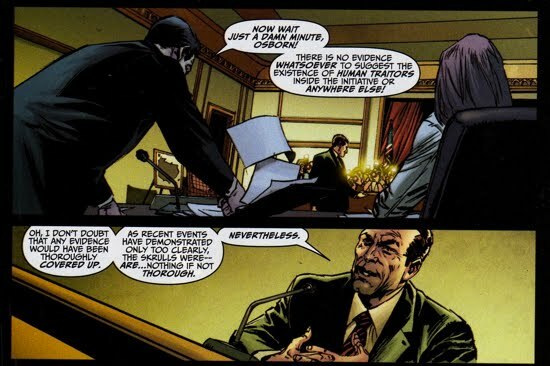 , Ben Urich understood Osborn's true nature and he confronted him during a press conference where the President of the United States announced Norman's new role. This interaction was featured in Secret Invasion Front Line #5. Osborn quickly deflected Urich's remarks and was able to turn the table on the reporter suggesting he was out to 'attack' Osborn. 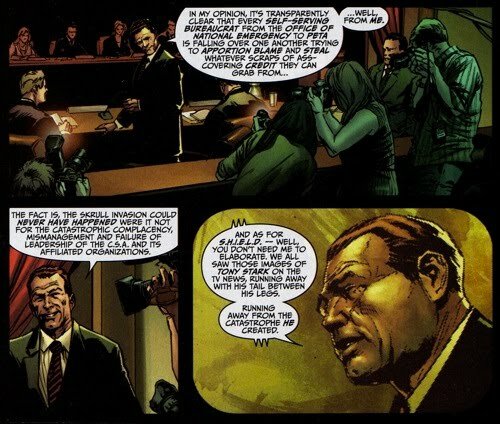 The charismatic Osborn not only shut down Urich's questioning but he was also able to garner support from the rest of the media as they clapped in support of Osborn. 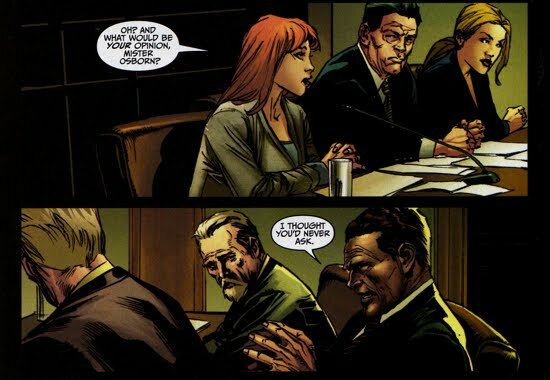 Urich was in disbelief at this change of public opinion (recall that Urich wrote a book about Osborn's past called the Legacy of Evil, summarized here.) Although Urich was unsuccessful in swaying public opinion, his anger toward Norman's status as America's top cop broke his case of writer's block as he began an attack on Norman's false-persona as a hero.